If you're looking for something a little out of the ordinary, try Flamingos By The Yard®. 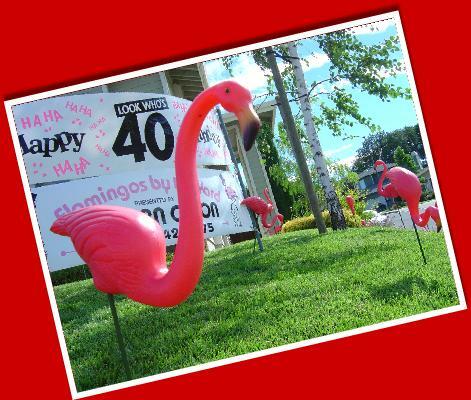 In the middle of the night our sneaky staff will fill the victim's yard with up to forty plastic pink flamingos and a six foot banner stating the occasion. Imagine their surprise as they pull their car out to go to work at 6:00 AM and see their yard swarming with these exotic birds! The flock will disappear the following evening leaving a fond memory of their visit (and no bird droppings!!!). We also can deliver Penguins, Cows, Pigs, Tombstones, and Hearts! CALL TODAY! Flamingos by the Yard Metro Atlanta: $159.95 + any applicable travel fees. Note: Orders placed within 48 hours of placement receive a rush fee of $20. Travel Fee: There is NO additional charge if your event is within 20 miles from zip 30188. For every mile over 20 miles there is a travel fee of $1.50 per mile or $10 whichever is greater. Your critters and a 2'x4' Sign will be placed in recipient’s front yard between midnight and 6am for a wake up surprise. They will be removed at dusk on same day. FIRST, we need a message for your telegram. (Yes, we actually give the recipient an actual telegram for all our services). Feel free so say a couple sentences in the message and then tell the recipient who the telegram is from. We will place this telegram in the mailbox for the recipient. AND THEN, We need a message for the 2’x4’ sign. The sign has 4 lines and can accommodate 8 characters/spaces per line. Examples: Holy Cow Bob’s 40! or Happy Flockin’ 50th Bob! or Someone Squealed! Tom’s 60! or Time to Chill! Bob’s 50! Flocks Of Love Nancy’s 40! Herd the Moos? Nancy's 40! We Moo for you! Nancy's 40! Logan’s 50 that’s no bull! Don’t have a cow! Nancy's 40! Nancy's an udder year older! •Porkers are here Nancy's 40! •Snorty snorty (name) is 40! •My heart beats for Nancy! •Have the coolest Birthday Nancy! •Flocks in shock! (name) graduated!